Factory-original color sales/promotional flyer for Namco Ms. Pac-Man / Galaga / Pac-Man combo video game. 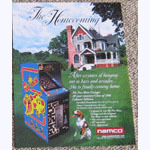 "Homecoming" version flyer. 1-sided, new condition. Limited number remaining.